A 20-piece personlised jigsaw puzzle with extra large pieces. 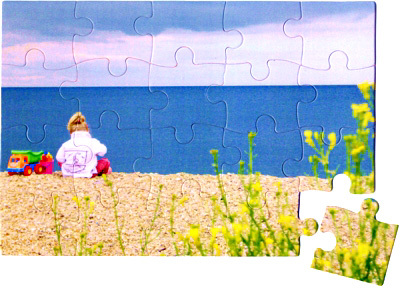 Our 20-piece personalised jigsaw puzzle has extra-large pieces, making it perfect for small children of three years and older. It’s a great way to encourage co-ordination and concentration in pre-schoolers. These puzzles are made from top-quality Daler Rowney artboard and measure 28 x 19cm. They are supplied in a durable see-through plastic wallet.